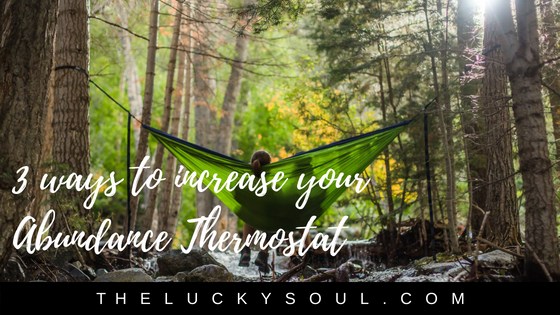 Did you know you have an "Abundance Thermostat"? It's the amount of abundance that you feel most comfortable with. If you think of it like an actual thermostat, it's like your 71 degrees. So, when your life or business or bank account or whatever goes above (or below!) that 71 degrees, you will do what you need to do to get back to your set point where your AT is set. If you look around your life right now -- at the amount of abundance you have in each area of your life -- that is your "71 degrees." It's where you feel most comfortable. And it's ok! It's not a bad thing! But here's the thing -- if you move beyond where your AT is set and you haven't worked on your resistance, you will get totally freaked out and start sabotaging your success. If your Abundance Thermostat says you can make 50k in your business, then that's what you get. And as soon as you start making say, 65-75k +, gigs are lining up, and things start rocking and rolling -- you'll throw a monkey wrench into your success so that you're back down to a level where you feel comfortable again. This is why I'm a fan of small incremental sustainable change over time -- so your brain doesn't get freaked out and you feel comfortable with each new level of abundance you hit. I want to share 3 small ways you can start to increase your AT. This doesn't necessarily mean monetarily, though it might. But start giving. Compliment everyone. Share resources (Tell your friend about the webinar or tell your co-worker about a cool new app to help her save money.) Connect people who may need a date or a business partnership. Put your extra change into the tip jar at the coffeeshop. So much of the time our focus is on what's wrong or what could go wrong. Start looking for reasons why the world is good and how things are getting better. In other words, start practicing GRATITUDE. Your iPhone connects you to a infinite amount of information and potential new connections (Wow!!). Maybe you found some change on the street or got money back on your last phone bill (Amazing!). Perhaps someone let you in in traffic or held a door for you (Yay!). NOTICE these small things and give thanks for them. When the universe sees that you're grateful for what you have, it will naturally start to send more your way. You want to start training yourself to begin living in an environment that supports you and makes you feel luxurious and nurtured. If you have things that are falling apart in your space, either fix them, toss them or get a new thing. If you always wash your own car, maybe go to the car wash for every other wash to practice hiring things out that don't light you up (You'll need to do this more and more as you continue to grow). As you begin to practice these new behaviors, NOTICE the RESISTANCE that comes up and TAP through it. Even if you just do a few rounds through the points, it's going to help calm your central nervous system down and help you feel relaxed about expanding. Move at a pace that feels GOOD and COMFORTABLE to you while gently pushing the edges of your comfort zone. Don't move to fast or you'll sabotage. There's no race to the Abundance Finish Line. Just keep acknowledging yourself, practicing gratitude and noticing where it might feel fun to push the edges of your life next. Where will you start to expand this week? How will you start increasing your Abundance Thermostat? Older PostHow happy are you allowed to be?